When Ed Dentel updated his Apple Watch on Thursday night, he didn’t expect it to upend his weekend, much less change his life. The 46-year-old communications consultant from Richmond, Virginia, does taekwondo with his family three times a week, bikes and skis frequently. He said he has exercised steadily and had no disease before. And then Apple Watch gave him an alert about his heart irregular heartbeat with the electrocardiogram app. 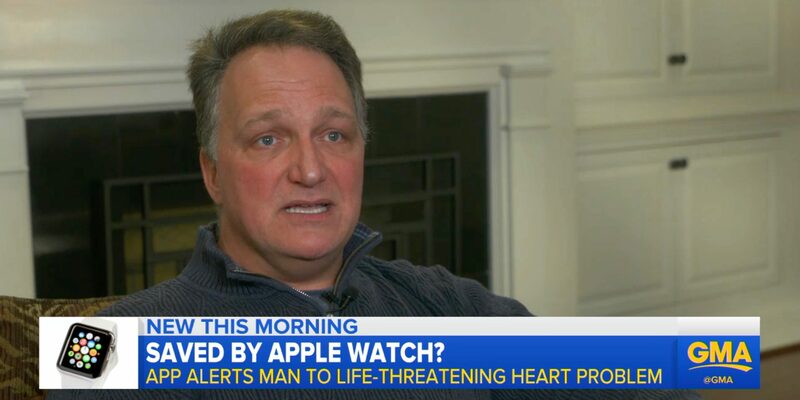 Ed Dentel received an alert from his Apple watch about an abnormal heart rate. On Friday morning, over breakfast with his 7-year old daughter, he put his watch back on. And the Apple Watch kept saying the same thing even he switches left to right again and again: “AFib.” Then he started to get a little bit alarmed about his health. Atrial fibrillation, commonly called AFib or AF, is a specific kind of irregular heart rhythm. If left untreated, it can damage heart muscles and increase the risk of stroke. So it’s important to catch the symptoms at the initiatory stage. And this is what Apple Watch did. Dentel drove to a nearby urgent care center while thinking it’s silly. But the one last time he checked his watch, it said ‘AFib’ again. Even Checking in, Dentel felt like a hypochondriac explaining that his watch told him that his heart has a probem. But after an exact exam, the doctor confirmed his diagnose. After that Dentel started learning about AFib and what its impact and how important it is to get an early notice of it. This article was written by reference of: here. Click the link if you wanna know more about atrial fibrillation.